British lawmakers voted overwhelmingly Tuesday to reject the EU divorce deal struck between London and Brussels, in a historic vote that leaves Brexit hanging in the balance. MPs in parliament's lower House of Commons voted by 432 to 202 to reject Prime Minister Theresa May's agreement with the EU. At least 70 of her Conservative Party, as well as sometime allies in the Democratic Unionist Party, had publicly pledged to join opposition Members of Parliament in voting against her agreement on Tuesday. That would translate into a defeat by a margin of 150 or more, the largest in more than a century. Even with abstentions, a defeat by more than 100 was the worst since 1924. 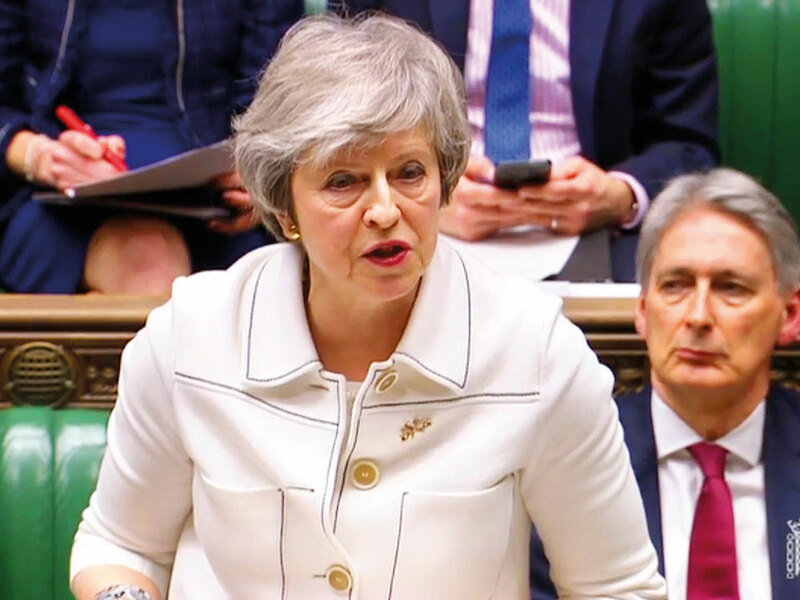 May postponed a vote before Christmas in the hope of winning over Parliament with new concessions from Brussels over the so-called backstop intended to ensure the post-Brexit Irish border stays open, but EU leaders’ letters of reassurance were treated with scorn in the House of Commons. We don’t think the Brexit deal is in the interests of the country overall... It is time for a general election, it is time for a new government. The British parliament has been the arbiter on some of the government’s most important decisions from approving closer trade and political ties with Europe to debates about war and peace during the last seven decades. But many historians, political analysts and lawmakers said last night’s vote was the most important in the post-war era. The outcome affects the lives of most of the United Kingdom’s 67 million people and will shape the future of the European project of forging greater unity. “We have known many worse times in this country, and some more dangerous times, but... not since the war have this house and this parliament faced a more important moment,” said Nicholas Soames, former Prime Minister Winston Churchill’s grandson and a lawmaker himself, in a debate. Earlier, as May appealed to her party in a closed-door meeting in Parliament, the prime minister’s opponents were eager for the next phase of battle. Former Foreign Secretary Boris Johnson welcomed the imminent demise of the deal and said he would support a no-deal divorce “with zeal and enthusiasm”. Former minister Nick Boles, meanwhile, set out a plan by which senior MPs would take control of the Brexit process. And he said that if they couldn’t agree, Britain’s departure from the EU, currently set for March 29, should be delayed. In October government ministers had talked about winning a large majority for the deal, but by December, when May postponed the vote hoping time to think would change MPs’ minds, it was clear she was looking down the barrel of a heavy defeat. But Steve Baker, a lead organiser in the pro-Brexit European Research Group of Tory MPs, angrily rejected overtures from government whips and denied reports that his members were softening their line. “We plan to vote no to everything: All amendments and the main motion, whether or not amended,” he said on Twitter. There was a blow for people campaigning for Britain to stay in the EU when Jeremy Corbyn, leader of the opposition Labour Party, used a meeting of his lawmakers to criticise the EU’s commitment to the “neo-liberal” economic model. His spokesman also told reporters that if the party fails to force a general election through a vote of no confidence in the government after Tuesday’s vote, calling for a second referendum is only “one option” it might pursue and not necessarily its next step.